It’s always nice to read a review that really summarizes an Adams Arms piston rifle build. In this review posted by Keith on Indianashooter.com (can be found here), he breaks down his review by his first impressions, how the rifle shot, cleaning, and final thoughts with pictures of his build. Read the review below. “I purchased an Adams Arms base mid length piston upper a few months ago and, thanks to the shootenanny, I’ve finally put enough rounds through it to get a good feel for the system. To start off with, this is my first AR. I’m also a lefty. I was considering getting a Stag Arms lefty upper as one of my main complaints with the standard righty DI AR’s I had shot was that I always felt like I was getting gas in the face. I also started researching piston systems, and, since gas isn’t being shot back in to the receiver, I figured a piston system could also solve my problems. I was also really intrigued with the piston concept as well, and everyone else I know has DI guns… might as well try something different. Plus, at $600, the piston upper wasn’t that much more than a comparable lefty upper. The fit and finish on the upper is pretty nice. The upper receiver itself is pretty standard. The bolt has a pretty cool milling pattern and the adams arms logo on it and looks well machined. The handguards are slightly enlarged m4 plastic handguards with aluminum heat shields. They aren’t too appealing to the eye. Due to the piston system, you are also limited to certain aftermarket handguards with some needing to be slightly modified in order to fit. The upper fit my lower perfectly and everything feels really solid. I’ve put about 700-800 rounds through it so far and have not had any FTF/FTE. Really the only issue thus far has been something really weird that happened when Audio1 was shooting it at the shootenanny. He chambered the first round of a magazine, pulled the trigger, and nothing happened. 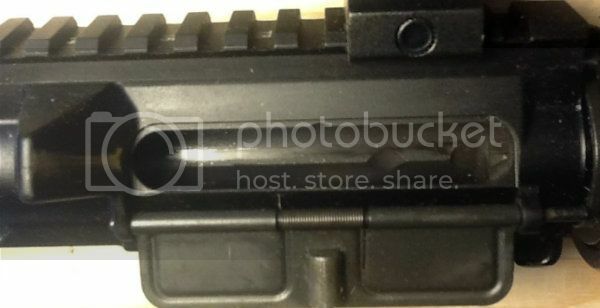 The bolt also remained locked forward and would not move back with the charging handle. We seperated the lower and upper, recocked the hammer, put the gun back together, and the round fired no problem. The gun continued to perform flawlessly the rest of the day. No idea what the hell happened there, but I’m chocking it up to a fluke/random occurrence. The felt recoil seems less than any other stock DI gun I’ve shot, and others who have shot it agree. Most of the reviews/feedback I’ve read online about the piston system say that felt recoil is greater, but that doesn’t seem to be the case with mine. The gun is very controllable during rapid fire. I also don’t feel like I get gas shot in my face. Who knows if this is just mental or if the piston system actually made a difference. Either way, I’m happy with it. Because gas isn’t shot back in to the upper, piston systems are supposed to keep the chamber/bolt much cleaner than a DI gun. Like I said, this is my first AR, so I don’t really have experience cleaning a DI AR for comparison. What I do know is that cleaning this thing was a breeze. So, if it helps for comparison at all, I took a few pics of the chamber and bolt when I got home from the shootenanny. The chamber and bolt both cleaned very easily with a quick wipe down. I had sprayed the chamber and bolt with some rem-oil before the shootenanny (which I probably didn’t need to do), so I think most of what built up in the chamber was due to that. I was quite happy with how easy the chamber was to clean. Adams Arms recommends cleaning the piston system every 1,000 rounds or so. Cleaning the piston system is 3 easy steps: disassemble, wipe it off, reassemble. The system is stupid easy to disassemble. There is a detented knob on the front of the gas block with three positions: straight up = normal operation, 45 degrees clockwise = suppressor operation (don’t have a full understanding of this setting yet, but since I don’t currently have a supressor, I haven’t really looked in to it), and rotating the knob to the 9 o’clock position allows diassasembly. The two pieces of the piston were still extremely clean, and a quick wipe with a cloth made them spotless. Looking at the last picture above, here’s how the system works: Gas goes up through the gas block into the gas block knob piece and shoots out the back, pushing the piston rod back. Piston rod pushes the bolt back. The bolt itself has a flat face where the gas key would normally be. I’m not sure if the spring on the piston rod is there to push the rod back forward or keep the rod from traveling too far back, as you figure the bolt would also push the rod back forward. Whether you are looking for an alternative to your standard DI system, or a rifle that shoots cleaner and has less maintenance, an Adams Arms upper may be for you. Check our our whole line of piston uppers HERE.